The Sith Triumvirate Raid opens with its first boss: Darth Nihilus. With 47 million health in the heroic tier, you are going to have to work hand in hand with your guildmates to take him down, while he relentlessly annihilates you. As all raid bosses in the Sith Triumvirate Raid, Nihilus has stacking tenacity whenever he gets damaged (+50% tenacity each time), which makes it very hard to land any debuff on him. He also gains +30 speed (stacking) whenever he’s damaged, so he takes turns very quickly. What makes the specificity of phase 1 is that Nihilus ignores your protection when he attacks. Because of that, one of the key things you’ll need to run a successful team is to have a way to heal back up. Protection being ignored means that you can die very fast, especially on the heroic tier where the damage is quite high. Another important thing to notice is that Nihilus will apply defense down for 1 turn on whoever damages him with a basic, and will then steal some of their protection (25%) if they attack him with a basic ability while they have defense down. You want to avoid that to happen too often, or else your damage will be significantly reduced by all the bonus protection you’ll need to get rid of first. For this reason, most efficient teams in phase 1 will be the ones that can either rotate between special abilities without having to use basics too often, or the ones that can resist defense down (for example by having a high tenacity / by constantly having tenacity up). Resistance – Let’s move on to the best teams to use in phase 1. For the reasons evoked above, the best team in phase 1 is a Resistance team led by Rey Jedi Training (RJT). Her leadership ability allows using special abilities most of the time (if a Resistance ally uses a special ability and if they have no debuffs on them, their cooldowns are reduced by 1, allowing them to get their specials back up more often). Her leadership ability also grants 70% to Resistance allies to expose their target when they score a critical hit, and these exposes cannot be Resisted. The full lineup is RJT(L), R2-D2, BB8, Resistance Trooper, and Scavenger Rey. R2-D2 is here for his exceptional support kit: his first unique, when zeta’ed, allows Light Side allies to dispel all debuffs from themselves whenever they score a critical hit. His second unique, when zeta’ed, gives a portion of his stats as bonuses to the rest of the team (among other stats, offense and health, which are both very good: more damage, and more health, so that Nihilus is less likely to kill you). BB-8 is here because of the ton of buffs he provides to the team. He can also call assists if you have a zeta on his first unique. Resistance Trooper and Scavenger Rey are here to deal damage. Resistance Trooper in particular, as he’ll take a lot of turns (he gains 55% turn meter whenever someone gets exposed). This team has no healer, but between health steal and foresights, they can sustain the damage Nihilus deals to them. If your team is low gear (g8-10), then you could have a hard time keeping everyone alive – you could consider replacing Scavenger Rey with Visas Marr (but you will need her to be zeta’ed). Resistance with Visas also works very well when everyone is max gear, but full Resistance has a higher damage ceiling. For more details on the strategy behind the RJT Resistance team for Phase 1 check out A Closer Look at RJT’s Resistance team for Phase 1 of the Sith Triumvirate Raid here at Gaming-fans.com. Jedi – Visas is actually best used elsewhere: inside a Jedi team led by Grand Master Yoda (GMY). 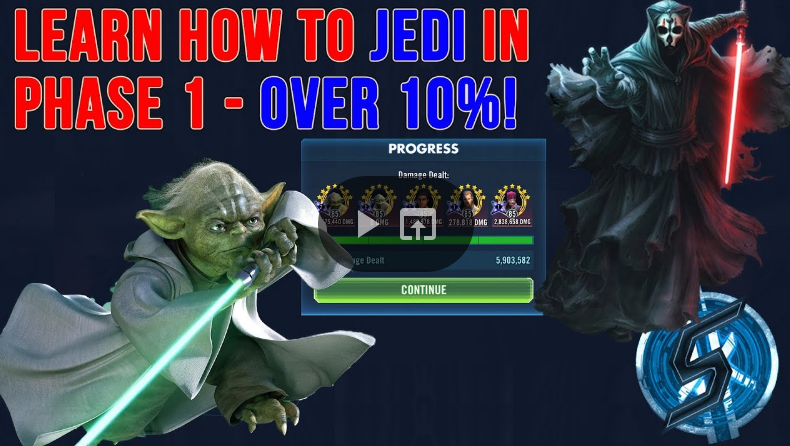 The little green Jedi master has a leadership ability that seems to have been specifically made to fight Nihilus in phase 1 of the Sith raid: whenever a Jedi ally suffers a debuff, they gain tenacity up, and when they resist a debuff, they gain 30% turn meter in addition to critical chance up and critical damage up. The full lineup is GMY(L), Hermit Yoda, Visas Marr, Ezra Bridger, and Qui-Gon Jinn. The idea is to hit Nihilus with Yoda as much as possible (he deals the highest damage) by calling him to assist with Ezra, Hermit Yoda, and Qui-Gon Jinn. Visas will assist and heal up the damage that the Jedi are taking. 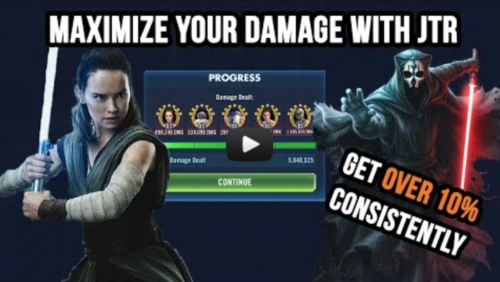 Since the rework of raid Nihilus (he used to reduce his cooldowns when stealing buffs with his basic ability, but now he lost that ability), you will be able to go very far into enrage with your Jedi team, which makes it a very high damage ceiling (on the same level as the Resistance team). First Order with Darth Traya – Another option for players who already have Darth Traya at 7-stars is a First Order team with Traya. Made up of Kylo Ren (Unmasked), Kylo Ren, FOO, FOE and Traya, the Isolate debuff is the key to the team because it adds a constant debuff to Nihilus which makes FOE’s hits more effective and adds survivability to the team. For more about this team including a video of it in action, check out IvanConQuer’s guide to making the First Order & Traya team work. Imperial Troopers & Thrawn – This team – Veers lead, Death Trooper, Colonel Starck, Grand Admiral Thrawn and Shoretrooper – works when looking for scores above 1 million in Tier 5 and around that range in Tier 6, but it is just a much better combo of characters for other phases of the Sith Raid. One recent test by ChrisB, leader of EotE, saw him hit 2 million damage in the Tier 5 STR with Veers lead, Death Trooper, Colonel Starck, Grand Admiral Thrawn and Luminary Unduli. Droids & Jawa Engineer – For those who do not have Rey (Jedi Training) but do have BB-8 and are looking for a team to put the soccer ball on, consider Mothman’s latest Tier 5 STR test. HK-47 lead with IG-86, R2-D2, BB-8 and Jawa Engineer which seems like it has the potential to graduate into the “effective” category based on the lower gear in the screenshot to the right. 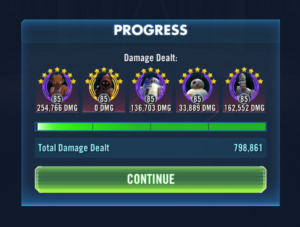 Nightsisters – Zeta Asajj Ventress lead – I have hit 1 million in damage in the Tier 6 STR with a Zeta Talzin lead in the past (zMother Talzin, Asajj Ventress, Nightsister Acolyte, Old Daka & Zeta Kylo Ren), but this is another team that does not translate well to the Heroic version of the raid. What was “effective” at the Heroic level was a Zeta Asajj Ventress lead with Mother Talzin, Nightsister Acolyte, Old Daka and Nightsister Zombie. With this team I was able to get nearly 1% of Phase 1 Heroic (0.95%, 428k), and a similar squad with Zeta Asajj Ventress lead, Mother Talzin, Nightsister Acolyte, Old Daka and Talia recently scored 1.6 million at Tier 5. Jedi – Qui-Gon Jinn lead – I used a QGJ lead for the speed boost with Jedi Knight Anakin, Ahsoka Tano, Ezra Bridger and Hermit Yoda and this team worked moderately well on a Tier 5 STR scoring 773k (0.72%), but I have not had a chance to test it on Tier 6 or 7 to date. I can see where Barriss Offee can replace Hermit Yoda and Aayla Secura could also replace one of the others. Wiggs Rebels – A Rebel team of Wedge Antilles lead with Biggs Darklighter, Han Solo, Commander Luke Skywalker and Chirrut Imwe is one I have tested in various combinations. In the Tier 5, with good but not great mod stats for Wiggs, can do 1-1.5 million damage in the Tier 5 STR. First Order – KRU lead – The First Order is a faction that has gotten a little bit of attention with the Sith Triumvirate Raid, and a Kylo Ren Unmasked lead with FO Tie Pilot, FO Officer, FO Executioner and Hermit Yoda scored 306k (0.66%) in the Heroic STR. While I could not duplicate this squad on my personal account, trading zKylo Ren for FOE I was able to do 780k (0.74%) in Tier 5, but FOE is a key piece to the team above.